The "peeps" are among the hardest birds to identify when you don't have experience with them. They are also especially difficult when they are in basic plumage but can be relatively easy to identify when in breeding and juvenile plumages. 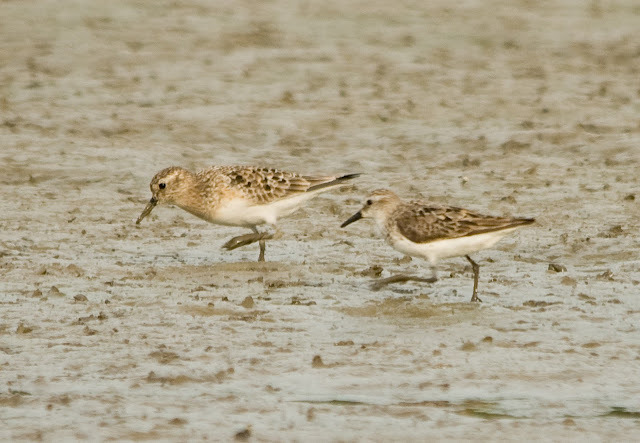 The peeps include 5 species of small shorebirds; Baird's, White-rumped, Western, Semipalmated, and Least Sandpiper. As always, breaking down this group will help with the identification of this group. Only the Baird's and White-rumped fit into this category and while neither is a large shorebird they are slightly larger than the other three species of peeps. The most noticeable difference between the two groups is the lenght of the wings when at rest. Due to the longer wings the "large" peeps have a slimmer, longer, more attenuated look. The Western, Semipalmated, and Least Sandpipers fit into this category. These are three of our smallest shorebirds; the Least ranks as the smallest sandpiper in the United States. As noted above, the "small" peeps have short wings that don't extend past the tail tip. This feature makes these species look more compact and less elegant. There are two species in this photo, one from each group mentioned above. Let us know what you think about the identification of the quiz birds!